The push is on. This will be one of the big battles of the coming year. 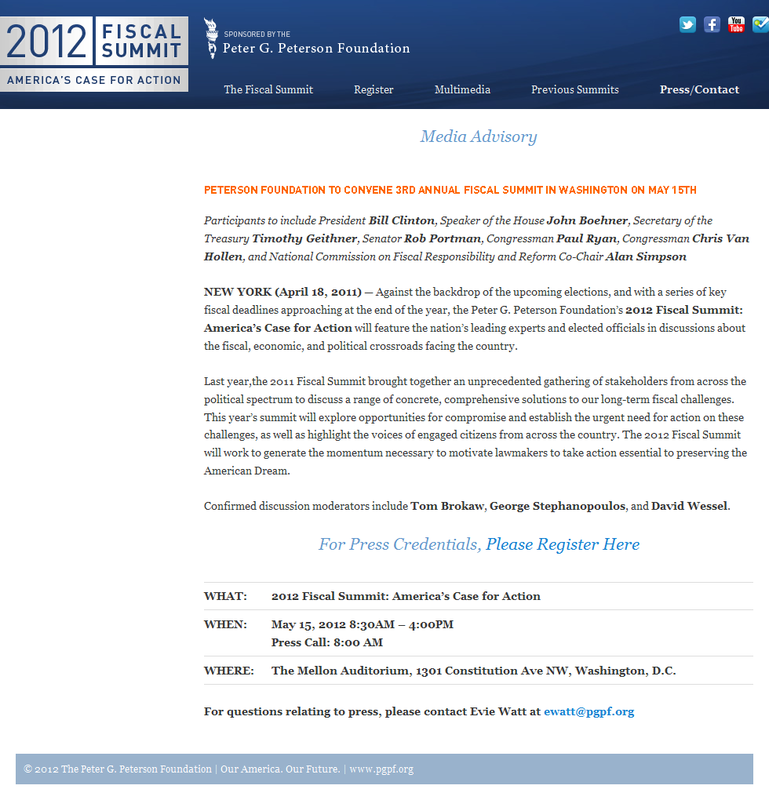 Now we have news that Pete Peterson (via the Peter G. Peterson Foundation) is hosting a “2012 Summit” to save America’s fiscal future. Website here if you need proof. Fiscal deadlines … crossroads … compromise … motivate lawmakers … Pete Peterson. Smells like a plan. 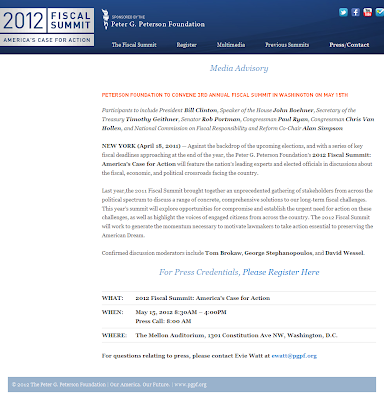 Two of the participants in this “Fiscal Summit” are Bill Clinton and Paul Ryan. Have you figured out yet they’re batting for the same team — the one that you’re not on? Have you figured out yet there’s zero distance between what Clinton wants and what Obama wants, safety-net wise? Oh, and here’s that media invite as a screencap, in case it too disappears from the “Summit” website. Click to see in a new tab. I’ll close on a positive note. This isn’t over; there’s an election coming, and that brings leverage and opportunity. Pelosi may not be toppled, but she can be repeatedly embarrassed in her district. There are senators up as well, not to mention Mr. Smarter-than-you. We do have some leverage; we just have to use it. I get that that’s scary, but this is the safety net, folks.